I was asked a very interesting question I think we all face at some point in our lifetime. “Do you have any regrets with your Mom passing”? Before I answer the question, allow me to share the process, that perhaps if we all lived this way, we just might live a life free of regrets. And of course, by now, you might already know my answer. Making every moment count is one way to live without regrets. This can apply to family or anyone in your life of whom you value. I like to call it a part of authentic living. Always try to end a discussion, argument or conflict with understanding. Try to understand your loved one— even if you do not agree with his/her way of thinking; or living for that matter. Develop an understanding of their feelings or logic. Talk to them in order to understand. This does not imply they are correct. This helps to keep a heated or hostile situation to a minimum. Work through anger. Anger is a corrosion of the emotional, mental, physical and spiritual system. Often times you may find folk will avoid a heated discussion, thus making it difficult to create a solution together. A good way to work through this is to explain your position as kindly as possible. Even if it appears you are not being heard, speak slowly, lovingly, but objectively on your position. Finish it off by confirming your love for them. End it by saying you are always open to hearing what they feel. If they say nothing, fine. Move forward respecting their position of silence. Always try. If your loved one does not attempt to respond to your gestures, it is okay. The relationship you want is not what they want. Attempt to bridge the gap of communication, understanding or togetherness. You can try to fix the areas of weakness in the relationship but, unless you get participation, because it takes two to build the relationship, there is not much you can really do. Never be the problem. Position yourself to be the solution. This is tricky. If you are a strong person, know that strength is oftentimes misunderstood. In this case, restate the problem gently, while offering ways to end in resolve. Always put in the effort to fix the problem. Make allowances for bad behavior. Yes. Sometimes you must bite the bullet and allow your loved one to be dramatic, argumentative, he/she may walk away, hang up the phone, even talk about you to others, or make false accusations. Take it. Try to offer peace as best you can. If that does not work, allow them to rant. They will either storm off, or you will exit the scene quietly. Honestly? You may see yourself choking them. This is normal. Don’t act on it, of course! If you feel this way, know that you are only human and some one with feelings. Try to avoid saying anything in anger that you must apologize for later. The way to avoid this is to detach from your feelings and attach to your logic and objectivity. Try not to end a situation with you owing the apology. If you say something out of line or something that is a verbal attack, stop and apologize, profusely. When a tragedy strikes or that person becomes sick, check in and offer help. Never allow him/her to stop you from doing good. Let go only after you have gone above, beyond and when you have done all you can. Sometimes, in order to minimize your pain, you must lovingly let go. This is not to say you do not love or respect your loved one. This just shows full acceptance that the relationship or resolve you so desire with this person cannot happen. Let go in peace, and take comfort in knowing that you did all you could. Don’t talk about the situation with everyone. Select only a few people who you trust to provide you with emotional support and honest feedback. Too much talking creates mess, and opens the portal for gossip. Confusion never solves anything. This is a hard one. There is no need to defend yourself. When you have handled a situation objectively, your responses and behavior far exceeds a ranting person full of emotion. These steps may be difficult for you— at first. After all, you are only human. You want the best out of any relationship you encounter. You will need to work through your own feelings of hurt, unfulfilled desires, and yes, even anger. The only way, is to accept and respect the desires of your loved one. He/she simply does not want what you want. Why want something with someone when there is a clear and present rejection of you? Move on to fulfill your desires in a relationship where someone wants to be your father, mother, sister, brother, lover, partner or spouse. Inputting good in the cycle of goodness will place you in a position where your needs will be met. Enjoy the freedom of no regrets! 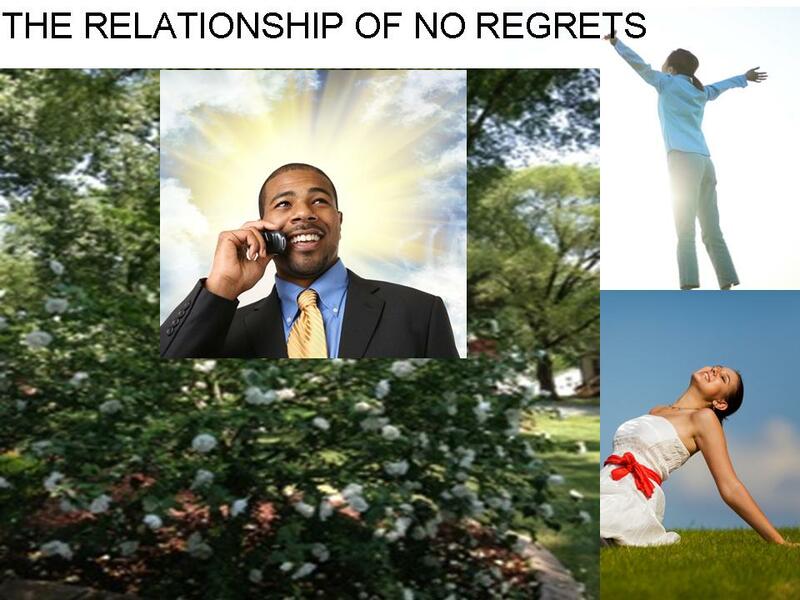 This entry was posted in Live and tagged death in a relationship, life free of regrets, no regrets, no regrets of death of a loved one, relationship of no regrets. Bookmark the permalink. I have no regrets as it relates to my relationship with my parents (I always include the male and females when I answer one of your post). They raised me to be upstanding and correct. They loved me and I them truly. My failures in life are mine, not theirs. My regret is that they never got to see my own children. I was not ready for children and was either smart enough to know how not to have OR GOD will knew better for me. They did see me in love, in true love (which I screwed up) and in that I am happy. They would have loved my children, and I do feel that they missed out on grand parents that would have taught them the whys and hows as to their father which in turned would help them love me that much more. This is my regret. I have moved on as you have mentioned in your post, but as the saying goes I still have that feeling that will be with me forever. Earl, that was beautiful. As you said God had a different plan. Your parents sound wonderful and obviously would have made great grandparents. As life offers us 365 days in one year alone, to right any wrong or to make improvement in our lives, we always have a chance, as long as we have breath in our body. It is always a pleasure to read what is in your thoughts. Thank you for sharing. Natalie, yet another moving, arousing piece by you! You always manage to capture the essence of what should be the heart of others! It is an amazing emotion not to sit in the seat of regret! Regret: Regret is a negative conscious and emotional reaction to personal past acts and behaviors. *Wikipedia* Often expressed and followed up by the term sorry, following the example in your above piece, can eliminate us having to express sorrowful regrets. I can say thank you,indubitably, without question or regret, for writting the above piece, and speaking to my heart once again. Thank you for sharing your thoughts Miss Liz!